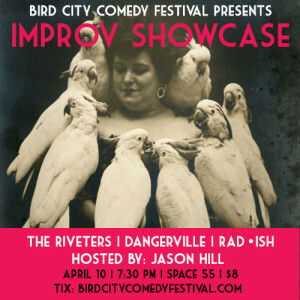 The Riveters is an all-female long form improv troupe from the Tucson Improv Movement (aka TIM). From a brief opening these hilarious ladies will create a montage of fun, fast, and smart comedic scenes right on the spot. Founded in early 2015 they headline and manage The Best Show Period, a popular all female comedy showcase at the TIM Comedy Theater on historic 4th Avenue. The Riveters is comprised of Esther Brilliant, Clare Shelley, Jessica Peck, Catherine Bartlett, Jessica Hill, Brooke Hartnett, Jessica Gregg, and Shanna Leonard. Born out of The Torch Theatre, Rad•ish started as a few friends playing around. They quickly evolved into a fast-paced, fun loving troupe. With the recent addition of improvised music scoring their scenes, Rad•ish plays the stage with energy and familiarity that is contagious to anyone watching. Dangerville was founded a few years ago by Jose Gonzales and Michelle Edwards. They originally wanted to create a musical improv troupe, but ended up becoming a band. They enjoy dressing up for their shows, playing covers, spitting fake blood at each other, and other silliness. 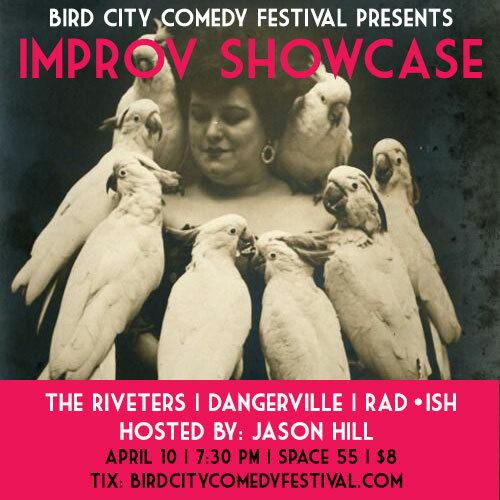 This event is part of the Bird City Comedy Festival. Space 55 passes cannot be accepted. Click here to purchase advanced tickets.